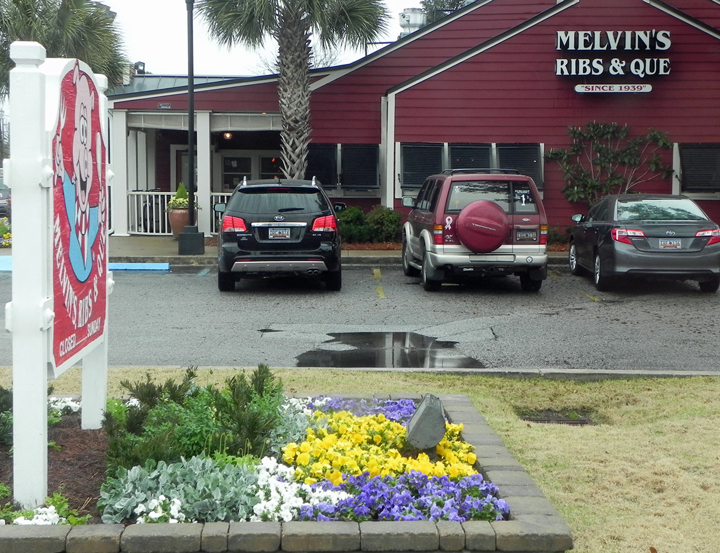 Melvin’s Legendary Bar-B-Q, Charleston, S.C.
On a rainy Monday morning heading out from James Island County Park we dropped into Melvin’s in Mt. Pleasant. Who says we can’t have barbecue for breakfast? I figured it would probably be pretty good since Melvin was one of the Bessinger barbecue family. I was wrong; it was really good. 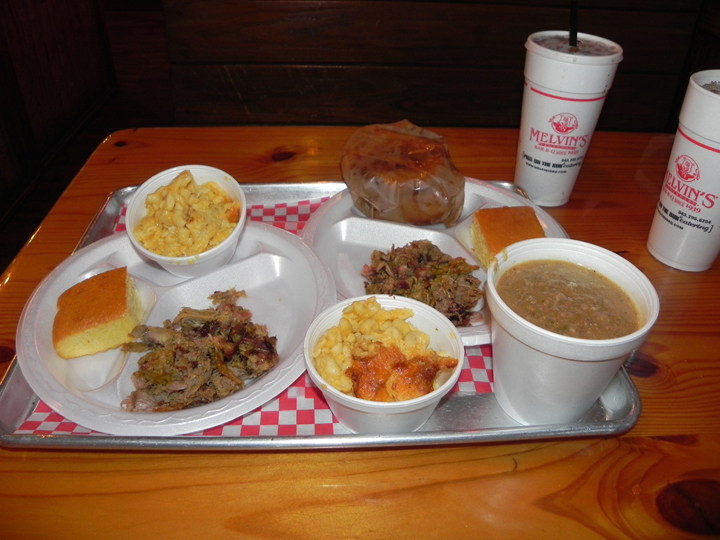 We both had the chopped pork plate, today’s special, which came with around one-third pound pork, cornbread and one side. We got mac’n’cheese and added sides, hash for me and onion rings for Mom. The first taste of the pork was stunning for both of us; it’s what barbecue should be. Distinct smoke but not too much, bits of crunchy bark and moist but no greasiness. The mac’n’cheese was thick and cheesy with a little crunchy topping. None of the orange stuff. Mom got a couple of onion rings. That’s right, a couple of huge onion rings. Unfortunately they were a miss; she says they were very heavily battered with a cake-like texture and greasy. Free Pickle and Pepper Bar! My hash was spot-on with lots of porky bits and that funkiness good South Carolina hash has. 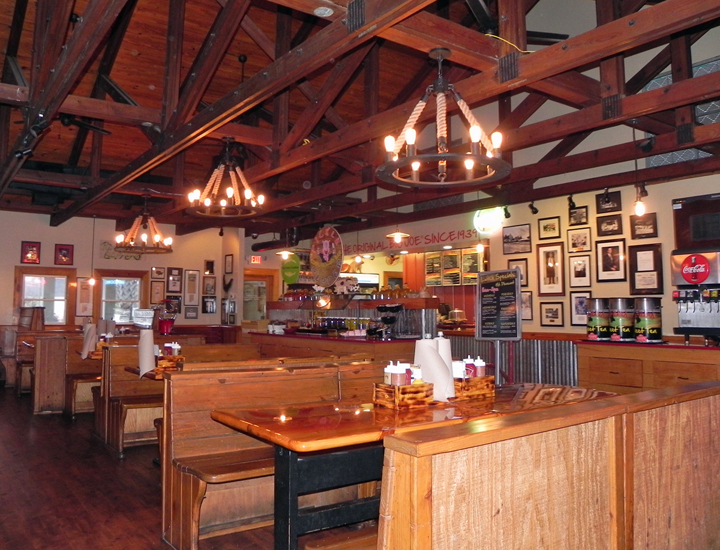 Recalling our visit to Shealy’s a few years ago, this was less mustardy. We did sample Melvin’s sauces although they weren’t needed on the pork. The mustard sauce is mild with a mustard and vinegar twang but it won’t knock you over, and the red sauce is a standard tomato-vinegar sauce, not sweet, and has a distince peppery finish. Both sauces are fine. On Wednesday we made the move from Ho Hum up to Holiday Campground at Ochlokonee Bay. We just happily tootled and toddled up US 98, stopped at some stupid “Summer Camp” Seaside wannabe while Oreo visited the facilities. Those muthas are fairly quickly ruining “The Forgotten Coast” for all but the chosen few. A good hurricane will probably fix that. Back to tootling and toddling. We rattled across the Ochlockonee Bay bridge and spotted Holiday CG but I proceeded northward because, you see, I had a plan. We saw the Two Blondes liquor store and the Big Top grocery and eventually got to my goal…Posey’s Steam Room! Posey’s is a dive Wakulla County beer bar, oyster bar and general fish house. I turned in, did a 50-point turnaround and parked. The Posey family has been in the Wakulla County seafood business since they were fishing from dugout canoes, and the food reflects that expertise. So then we burped our way down the road back to the campground. Thanksgiving day we did a turkey breast in the little Weber. Big breast, little Weber. Big breast as in held up the lid of the little Weber. I knew a girl like that once but I digress. So we spatchcocked the already-spatchcocked and the lid just rested on top. The goal, mind you, was to smoke and roast the turkey breast because Mom HAD to have the traditional Thanksgiving. It was a new grill, not a low-temperature smoker, so of course the first thing is that the fire went out. Then got hot, reading HHH on the thermometer, then went out again. 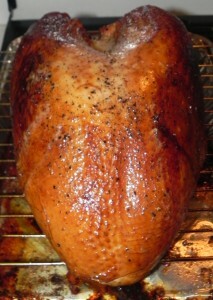 We did that a time or two and, two hours later, pulled off a perfectly smoked, bronzed and moist turkey breast. It looked really weird laying there without legs or thighs, but it ate mighty good. The next day’s project was to have a walk. Not a normal walk, a Mom walk. So we went off over the river and through the woods, up US 98. The first stop was the quick-rip at the corner of Mashes Sands road; we confirmed that they had the basics that might be required. The next stop was Tropical Trader Shrimp Company where we had breakfast at the crack of noon complete with draft beer, and the last stop was Two Blondes liquor store where we met one of the blondes. Fortified with fried mullet and booze, it was back to the campground.